If you don't depend upon headset speakers and want to convert any microphone into a convenient wireless microphone, this is the perfect solution. Although made for use with a video camera and bundled with a simple lavalier microphone, there is nothing about this unit that prevents it from being the ideal means of making your favorite speech recognition microphone a wireless microphone. 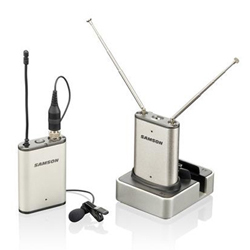 The transmitter features a standard 3.5 mm (1/8 inch) jack which will accomodate any wired microphone with a 3.5 mm microphone plug. Although the transmitter is equipped with a removeable belt clip, it is so small that it can easily fit in a breast or coat pocket (the transmitter weighs just 1.5 oz and is 1/2 inch thick). Unique to this system is the ability to choose one of two transmitter output strengths and the ability to export the signal from the receiver at either mic- or line-level. Working range 300m (100 ft.) - in line of sight.